Time to sit and watch hours upon hours of football. Grab the chips and salsa. Grab the cooler. Grab the wings. And sadly, in these days, time to grab your smartphone, click on your social media app, and give everyone a play by play of how your team is doing. If things are going your way, you rub it in everyone’s newsfeed. If your team is doing terrible, you’re mysteriously silent. If your team catches up, it’s the greatest comeback in the history of anything. Football + Social media tends to make harmless, normal, loving people into obnoxious jerks. We all seem to think our team is the best. And the other team is the worst. We all become experts on all things football. Each year, I make a formal proclamation at the beginning of the football season on my Facebook page. See, I am what’s known as an Alabama fan. And I’m a recovering fan-a-holic. We need to be careful how we come across in our fanaticism. I love being an Alabama fan. I’m a Yankees fan. I’m a Titans fan. 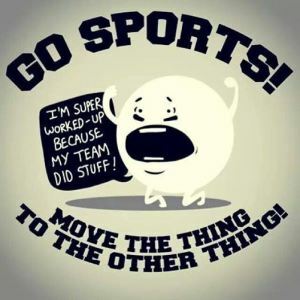 I love my “sports teams” and think they’re the greatest. But we just need to remember how we come across as we’re posting our comments. Love your team, but love others. I’m a fan of Justin Bieber. There, I got that out of the way. But, I’ve never once listened to any of his music. I’ve never read any lyrics to his songs. I couldn’t tell you the name of one his songs. But I’m a big fan. I know I may get ridiculed for having “Bieber Fever”, but I really don’t care. The kid is just awesome. In a society of teen pop culture icons, its good to see that so far, one of them has kept their head on straight. After seeing the downfalls of so many going from child star to young adult inmate, its refreshing to see that Justin, to this point, has not met that demise. I hope that he won’t ever fall from where he is right now. Recently on Extreme Home Makeover, Justin Bieber was a guest star in support of a family who lost their daughter to texting while driving. You can read more about that episode by clicking HERE. That night, he had a concert and invited the younger sister of the victim to be his guest of honor. Being a young teenager, she was thrilled, and got to bring along several friends. She had a private pre concert party with Bieber, and then Justin told her that $1 from every ticket sold that night was going to help their cause of stopping teens from texting and driving. It was that night I became intrigued as to how such a young guy could have such a big heart. Since then I have found out about several other things he does to help out. Last summer, Bieber gave a sizable donation to victims of the Nashville Floods. He speaks out against bullying in school. He donates to the Children’s Miracle Network. $1 from every ticket sale to all of his concerts goes to Pencils of Promise, an organization that builds schools for third world countries. A simple google search will reveal many charities he helps out with, and he seems to be always looking for a way to help. As a parent of a young child, I hope that future child and teen stars can look to him as a way to get it right. I know he was raised right. Recently, Bieber’s mom issued a public prayer request to ask all his fans to pray that he would continue in the ways he seems to be headed, and not be influenced in a negative way by his fame and fortune.